Afghanistan divided over security pact with U.S.
KABUL, Afghanistan A security pact with Washington that says U.S. forces staying in Afghanistan beyond 2014 will not be tried in local courts for any crimes they commit could be a deal-breaker for tribal leaders, clerics and other influential figures who gather Thursday to debate the draft agreement. An Afghan spokesman told Reuters that President Barack Obama had agreed to write a letter to the Afghan people acknowledging mistakes made during the "war on terror" and the suffering of the Afghan people. The Afghan side is waiting to get the letter this evening, CBS News has learned. The Loya Jirga, a traditional council of 3,000 prominent Afghans, can revise or reject any clause of the draft agreement. But National Security adviser Rangin Dafdar Spanta told lawmakers at a weekend briefing that the U.S. position was clear: If Washington doesn't get jurisdiction over its soldiers and civilian personnel, it won't sign the agreement, and it won't leave any U.S. soldiers in Afghanistan when international combat troops withdraw at the end of 2014. The Loya Jirga's members may seek amendments, but if they reject the security pact, it is almost certain the Afghan government won't sign it. Even if it is approved, the final decision will be made by Parliament. Divisions run deep in Afghanistan over conceding the right to prosecute U.S. soldiers for crimes committed in the country. 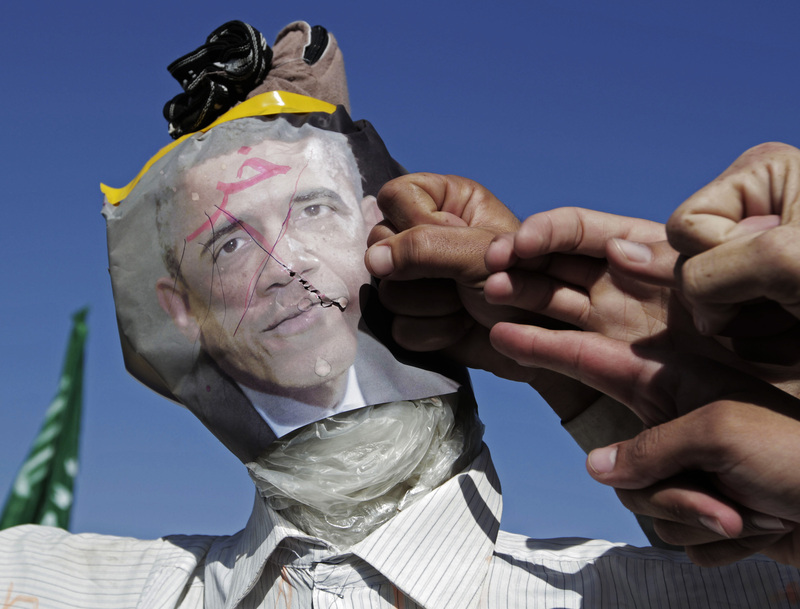 In eastern Afghanistan, scores of university students wearing headbands bearing an inscription from the Quran burned an effigy Tuesday of Mr. Obama to protest the pact and its provision relinquishing prosecution of American soldiers in an Afghan court. A protest meeting also was held Monday in the Afghan capital of Kabul. Afghans are still angry over several incidents involving international troops, including the 2012 accidental burning of hundreds of copies of the Quran; a shooting spree that year by a U.S. soldier in southern Afghanistan that killed 16 people, mostly women and children; and the unintentional deaths of civilians by wayward bombs. Hakimullah Mujahed, one of the Loya Jirga's organizers, said "the security agreement with the U.S. has to be in the framework of the Afghan constitution." "The trial of foreign soldiers accused of killing innocent Afghans or committing crimes against Afghanistan should be tried in an Afghan court. That's very important," he added. Lawmaker Khaled Pashtun from southern Kandahar, where a Taliban insurgency flourishes, disagreed. He said Washington is right to demand jurisdiction over its troops. "Our justice system is still under construction. ... Even Afghans don't trust it yet," he said in a telephone interview. Pashtun said the government "is so weak" that it hasn't been able to arrest a southern warlord accused of killing 117 civilians. Spanta told lawmakers that Afghan President Hamid Karzai had also won concessions in the 10-year agreement. U.S. congressional aides originally told The Associated Press that the accord explicitly denied U.S. soldiers the right to enter Afghan homes, something Karzai has demanded. But a senior U.S. official said Tuesday in Washington both sides were still negotiating the point, with the U.S. seeking more flexibility. The official, who spoke on condition of anonymity because he was not authorized to talk publicly about the negotiations, said the key is to agree on acceptable phrasing that provides more flexibility, but so far the sides have reached no agreement. If the pact is passed, U.S. troops will have sole control over Bagram Air Field, north of Kabul, but will share facilities on eight Afghan-run bases throughout the country, Pashtun said. Spanta also told legislators that about 10,000 to 16,000 residual U.S. and NATO service personnel would stay behind in Afghanistan after 2014, lawmaker Shah Gul Rezayee told the AP. They would mentor and train the Afghan security forces, she said. The independent Afghan Analysts Network, which gave details on Spanta's briefing, said Karzai also won a key security agreement from the U.S. that promised joint action - political, economic or military - against anyone attacking Afghanistan or giving safe haven to Afghan insurgents seeking to unseat the government. While Pakistan was not mentioned, Karzai routinely accuses its neighbor of harboring members of the Afghan Taliban. The Bilateral Security Agreement is a sweeping document that incorporates the usual Status of Forces Protection Agreement, which the U.S. signs with every country where its troops are stationed. The document covers everything from taxation and customs duties to a promise to protect Afghanistan from hostile action. While Afghans may be divided over the agreement, they are also pragmatic and know they need international forces in the country, said Kabul University professor Hamidullah Faruqi. "They will guarantee our stability. They will show to our neighbors that Afghans are not alone, and the financial aid that will come along with this agreement will benefit Afghans, and Afghans know this," he said. Faruqi said the outcome of the Jirga will depend on who is chosen to attend the session by Karzai's selection committee. Karzai's relationship with Washington has deteriorated steadily since the 2009 presidential election, when he was accused by several Western countries, including the U.S., of engaging in widespread fraud. Since throwing out the Taliban in December 2001, the government has turned to the traditional Loya Jirga to decide key milestones in Afghanistan's transition to democracy, including the framing of a constitution. Security that was already tight ahead of the convening of the Loya Jirga was stepped up considerably after a weekend suicide bomber struck near the site, killing 12 people, including three national security personnel.